Achieve Installation Perfection with InstallerParts - Choice of Audio, Video, and IT Professionals! Each item that we offer has been hand selected by our team and achieves our standards for premium quality. Our factory-partners employ industry environmental standards such as ISO9001, ISO14001 or RoHS. With our factory direct low pricing, fast same-day shipping, flexible 30-day Amazon-matched return policy and a lifetime warranty on most non-electrical items, you can purchase InstallerParts products with maximum confidence. Join the long list of satisfied InstallerParts customers by clicking the "Add to Cart" button at the top of the page NOW. SAFETY: This 6 Outlet Power Strip is UL listed and designed with an integrated 15 Amp circuit breaker for overload protection on all outlets. LENGTH: Our long cord power strip has a 10-foot heavy duty extension cord and durable power cord that allows you to extend your outlets to the location of your choice. BUILT-IN FEATURES: This heavy duty power strip features 6 perpendicular outlets with twist-to-lock safety covers and a red LED power-on indicator to reduce clutter and increase functionality. 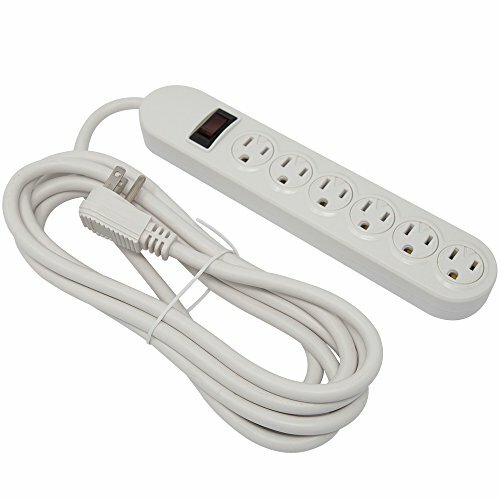 MULTIFUNCTIONAL: The power strip is perfect for phone, lamps, home appliances, electronic equipment, computers, and any other electronic needs! If you have any questions about this product by Prime Wire & Cable, contact us by completing and submitting the form below. If you are looking for a specif part number, please include it with your message.